Buy PDF Password Download Complete PDF How do I open and print my eBook? 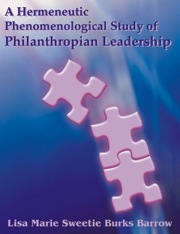 This hermeneutic phenomenological study explored leadership by means of accessing the lived experiences of leaders perceived as being philanthropian in bureaucratic, mechanistic organizations in Canada and the United States. Philanthropian leaders display the following characteristics: (a) love, (b) compassion, (c) caring, (d) altruism and (e) perceptive listening. The selection process relied on the criterion and snowball sampling techniques as means for choosing thirty participants for the in-depth interviews. After the transcription of the interviews, an analysis of the data occurred using Atlas.ti, a software program. Three themes emerged. These themes centered on the leaders' mindsets, leadership tools and the emergence of the philanthropian leadership phenomenon. The implication was that employees responded positively to attitudes and behaviors of leaders who acknowledged and emphasized the value of employees. Dr. Lisa Barrow received her Doctor of Management degree in Organizational Leadership from the University of Phoenix and her Master of Science degree in Industrial Technology from Buffalo State College. For many years, she has been interested in improving the leader/employee relationships in organizations. Dr. Barrow has created a new leadership model referred to as Philanthropian Leadership. Philanthropian leadership is a moral leadership approach that will enhance the twenty-first century leader/employee relationship.